LEARNING LEVELS for mathematics were progressively lower among government school students as they progressed from class to class, a massive survey found. The National Achievement Survey (NAS), conducted by the NCERT last November, is the country’s largest sample survey of learning outcomes for Classes III, V and VIII. Covering 2.2 million students of 1.1 lakh schools across 700 districts, it measured outcomes in terms of the percentage of questions answered correctly by respondents.The mathematics score nationally is 64% in Class III, drops by 10 percentage points to 54% in V, and then to 42% in VIII. The gap between Class V and Class VIII students is sharpest for Telangana, which sheds 23 points, from 56% to 33%. The state is followed by Jammu and Kashmir (17-point gap) and Uttarakhand (18 points). State for state, Karnataka and Rajasthan aced the results. Arunachal Pradesh, on the other hand, had the worst performance. The NAS survey assessed children in mathematics, language, environmental sciences (EVS), science and social sciences. Its findings are significant as it covers the student population, especially those in Class VIII, which has benefited from provisions of the Right to Education Act that came into effect from March 2010. The survey results found Class VIII students of Rajasthan scoring the highest in language (76%) followed by Gujarat (64%) and Maharashtra (63%). Jammu & Kashmir had the worst performance in language, 43%. Rajasthan, Jharkhand and Karnataka topped the states in science and mathematics in Class VIII. 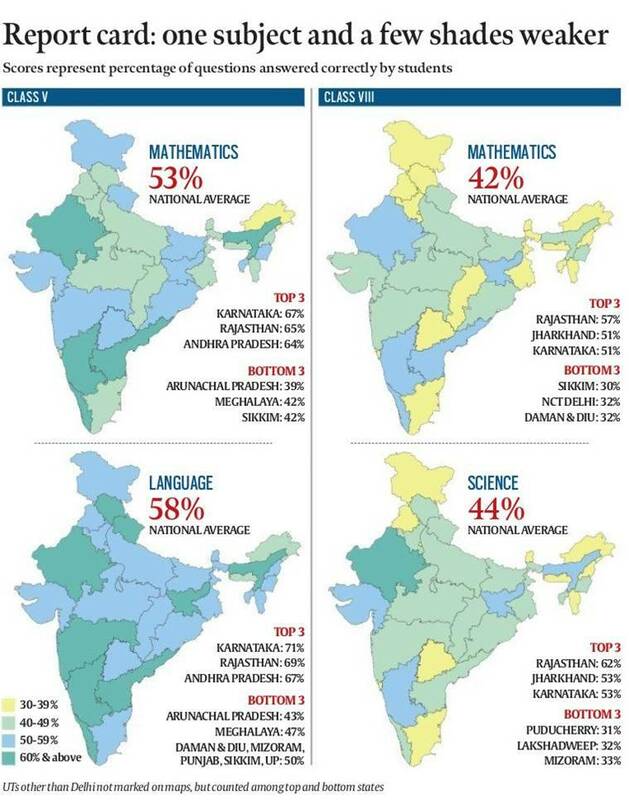 Rajasthan scored 57% in mathematics followed by Jharkhand and Karnataka (both 51%). In science, Rajasthan scored 62% while Jharkhand and Karnataka tied again, at 53%. Class VIII students of Sikkim scored the lowest in mathematics (30%) and Puducherry did the worst in science at 31%. Class VIII students of Delhi were among the worst performers in both mathematics (32%) and science (34%). In Class V, for mathematics, Karnataka (67%), Rajasthan (65%) and Andhra Pradesh (64%) were the top three while Arunachal Pradesh was at the bottom. In language, Karnataka, Rajasthan and Kerala students scored the highest and students of Arunachal Pradesh (43%) again the lowest. For Class V, there were 13 questions in EVS, two in language and 15 in mathematics. For Class VIII, there were one question in language, 20 in mathematics, 12 in science and 22 in social science. A learning outcome survey gauges students’ understanding of a subject, concepts and their application but does not test their memory. Last year, the Centre amended rules under the RTE Act making it compulsory for all state governments to codify expected levels of learning that students in classes I-VIII should achieve in different subjects. The NAS survey of November was part of the effort to gauge students’ learning based on indicators drafted by the NCERT. For instance, in mathematics, Class III students were assessed on a bunch of learning objectives, including whether they could read and write numbers up to 999 using place value, add and subtract three-digit numbers, identify and make 2D shapes by paper folding and read time correctly to the hour using a clock or a watch, besides other things. The language test for Class III students gauged whether they could read small text with comprehension, identify main ideas, details and draw conclusions. They were also asked to read printed scripts on classroom walls, such as poems, posters and charts. HRD ministry sources said the government will draft and share short-term, medium-term and long-term interventions, based on NAS results, with state governments. NAS also mapped responses on qualitative questions such as whether students are able to understand what teachers teach in class, whether they like to go to school and whether they find it difficult to travel there. NAS found that 93% of students in Gujarat could understand what the teacher says in class, but only 66% of students of Arunachal Pradesh were able to do the same. In Nagaland, there was a pointer to the importance of teaching students in their mother tongue. Only 22% of the students in this state said the medium of teaching in class is the same as the language spoken at home. Contrast this with Daman and Diu, where 87% of children say that they are taught in the same language they use at home. What does autonomy mean for Panjab University?